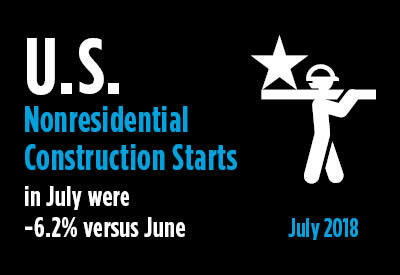 ConstructConnect announced today that July’s volume of construction starts, excluding residential activity, was $38.8 billion − a month-to-month change of -6.2%. Historically, there has been a June to July climb, thanks to favorable seasonality, of +3.5%. July, though, is usually the last month of the year in which the bias, due to construction-friendly weather, is upwards. July 2018’s nonresidential starts volume was +9.5% compared with July 2017. July 2018 versus the five-year average for July, from 2013 through 2017, was +20.9%. Year-to-date nonresidential starts in 2018, compared with January-July 2017, have been -2.3%. The starts figures throughout this report are not seasonally adjusted (NSA). Nor are they altered for inflation. They are expressed in what are termed ‘current’ as opposed to ‘constant’ dollars. ‘Nonresidential building’ plus ‘engineering/civil’ work accounts for a larger share of total construction than residential activity. The former’s combined proportion of total put-in-place construction in the Census Bureau’s June report was 56%; the latter’s share was 44%. The latest Employment Situation report from the Bureau of Labor Statistics (BLS) records a +19,000-jobs improvement in the construction sector in July. The monthly average increase in ‘hard hat’ hiring so far this year has been +24,000, a surge forward of exactly half relative to January-to-July-2017’s comparable figure of +16,000. The unemployment rate in construction in July 2018 was only 3.4%, a notable achievement since it was better than the all-jobs rate of 3.8%. Only rarely does construction’s unemployment rate fall below the ‘headline’ rate. A year ago, when construction was at a 4.9% jobless level, the whole economy was at 4.3%. The jobs count in America’s construction sector in July 2018 was +4.4% versus July 2017. The year-over-year staffing performances in other industrial sectors with close ties to construction have been: ‘cement and concrete product manufacturing’, +1.0%; ‘real estate firms’, +2.3%; ‘building material and supplies dealers’, +3.0%; ‘architectural and engineering services’, +3.2%; ‘oil and gas extraction’, +5.2%; and best of all, ‘machinery and equipment rental’, +13.2%. The -6.2% pullback in total nonresidential starts month to month (m/m) in July resulted from softness in industrial (-57.4%), institutional (-31.1%) and heavy engineering/civil groundbreakings (-8.6%). Commercial (+48.1%) separated from the pack and did quite well. As for the +9.5% year-over-year (y/y) ‘pop’ in total nonresidential starts (i.e., July 2018 versus July 2017), there were improvements in the commercial (+39.1%) and heavy engineering (+9.5%) type-of-structure categories, while industrial (-39.6%) and institutional (-9.6%) faltered. The -2.3% step back in year-to-date (ytd) total nonresidential starts (i.e., January-July 2018 relative to January-July 2017) was due to declines in commercial (-15.5%) and institutional (-10.2%) that were not fully offset by engineering (+13.4%) and industrial (+33.0%). Within engineering starts, the dominant subcategory so far this year (with a 39% share) has been ‘roads/highways’. Street work in July was strong on all counts: +20.0% m/m; +28.0% y/y; and +10.8% ytd. The next biggest slice (21%) of civil starts to date in 2018 has been provided by ‘miscellaneous civil (pipelines, etc. )’ undertakings. The percentage changes for ‘miscellaneous civil’ in July were bearish m/m (-75.3%) and y/y (-51.7%), but bullish ytd (+90.9%). By far, the largest subcategory within the institutional designation so far this year has been ‘schools/colleges’ (a 59% share). Nevertheless, educational facility starts in July were disappointing across the board: -35.4% m/m; -0.5% y/y; and -5.8% ytd. Next most important to institutional starts through the first seven months of 2018 have been ‘hospitals/clinics’ (a 12% share). In July, health care facility starts were dismal: -42.1% m/m; -57.2% y/y; and -24.8% ytd. ‘Private offices’ (with a 22% share) and ‘hotels/motels’ (with a 20% share) have been the leading subcategories within commercial so far this year. The former, thanks to an initiation of work on major new office space in New York in July, was +487.3% m/m and +225.0% y/y. But ‘private office’ starts were still down year-to-date, by -12.4%. As for ‘hotel/motel’ starts in the latest month, they were -11.9% both m/m and y/y and -15.6% ytd. ‘Retail/shopping’ and ‘warehouses’ (tied with 14% shares) have also made big contributions to commercial starts so far in 2018. ‘Bricks and mortar’ retail in July was +41.8% m/m; and +6.0% y/y; but -13.1% ytd. Warehouse work was +10.1% m/m; -36.6% y/y; and -16.5% ytd. The 12-month moving average trend graphs are showing recent stabilizations, as opposed to descents, in nonresidential building and commercial starts, while there continue to be upward sloping curves in heavy engineering and its major subcategories. From Table B-3, the average annual compensation hikes in July 2018 for ‘all jobs’ nationally were +2.7% hourly and +3.0% weekly. Construction workers, as a subset, saw their bank accounts swell faster, +3.2% hourly and +4.0% weekly. In Table B-8 (excluding bosses), the discrepancy is even greater. While the ‘all jobs’ earnings gains remained at +2.7% hourly and +3.0% weekly, construction workers were rewarded with +3.6% hourly and +5.1% weekly. 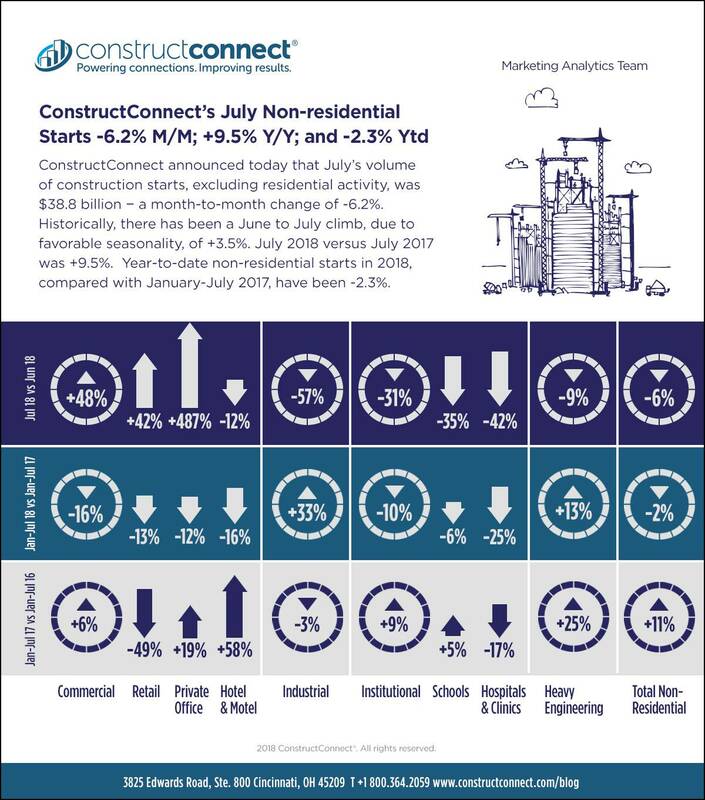 ConstructConnect’s single-family plus multi-family residential starts in July were -5.7% m/m; -1.4% y/y; and -5.8% ytd. ‘Grand total’ starts were -6.0% m/m; +4.7% y/y; and -3.7% ytd. ConstructConnect has now moved to a better-targeted and research-assigned ‘start’ date. Prior to January 2017, the ‘start’ date was recorded as occurring within 30 to 60 days of the announced bid date. In concept, a ‘start’ is equivalent to ground being broken for a project to proceed. If work is abandoned or rebid, the ‘start’ date is revised to reflect the new information. Click here for the Top 10 Project Starts in the U.S. – July 2018.